Trump is President and he's giving a luxurious speech from the East Room of the White House. Join him and his paid audience as he updates America on the Hunt for Rosie O'Donnell, the construction of the first ever transcontinental hair oil pipeline and his plan for bronzing illegal immigrant's babies and using them for actual ships anchors. Bring your questions and the Don will answer them. Atamanuik created and stars in Comedy Central’s THE PRESIDENT SHOW and its affiliated specials. Atamanuik has been performing and teaching improv at UCB for over 16 years. He has achieved critical acclaim and a fervent new fan base with his pitch perfect Donald Trump impression skewering the candidate with razor sharp comedic activism on the Trump vs. Bernie 40 city tour and debate and sketch specials for Fusion in 2016. Atamanuik’s album TRUMP VS. BERNIE: LIVE FROM BROOKLYN debuted at iTunes at #1 and was deemed as a must-have album in 2016. He performed his Trump multiple times on THE HOWARD STERN SHOW, ABC's THE VIEW, Sarah Silverman’s I LOVE YOU AMERICA, THE DAILY SHOW WITH TREVOR NOAH and did a weeklong "takeover" co-hosting Comedy Central's @MIDNIGHT. 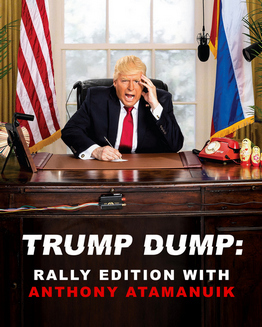 Atamanuik has also performed his solo show “Trump Dump” at the UCB NY theater, SXSW Festival, and Moontower Comedy Festival. He was honored as one of Variety’s Ten Comics to Watch at the 2016 Just for Laughs Comedy Festival in Montreal and returned to JFL in 2018 to perform TRUMP DUMP. His book, AMERICAN TANTRUM, launches this fall.